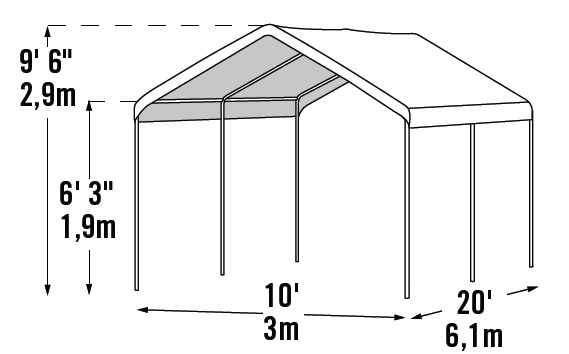 If you need a quick, sturdy, inexpensive shelter or garage Shelter Logic 10 x 20 Max AP 6 Leg Canopy Shelter is a great solution to your problem. The 100% polyethylene waterproof cover is treated for hold up under UV rays, resist fading and resist fungus. The cover is stretched over a sturdy welded steel frame. 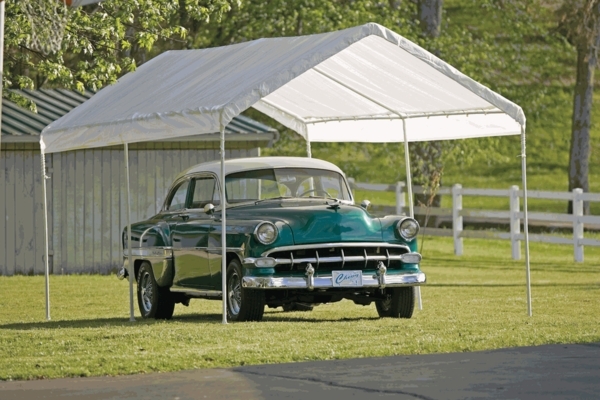 The cover is wrinkle free and is tight in the frame to ensure the canopy is square. The footpads can be anchored down to keep the canopy in place. How tall is this? For me, wind may be an issue. Can it be lowered so it is only 8 ft high? The peak of this unit is only 9' 6" tall. One could indeed shorten the overall height of the unit by simply cutting down the lower leg poles. I notice on the second page of instructions, under "Caution", it says to secure and bolt together overhead poles. I take it that you have to drill your own holes and buy the hardware for bolting. Is this for both ends or just the un-swedged ends? ShelterLogic stated that page in the manual is a standard in all their manuals. The 25757 does not require bolts. I want to install this on my wood deck, can I use screws to attach it instead of tie downs? And what does the foot pad look like? Is the cover heavy enough to leave it up all summer? Finally, are the side legs all one piece? There is a product manual on the item page. It shows a list of the parts and you will be able to see exactly what the foot looks like. We are unable to make recommendations regarding screwing to your deck as it is intended to be anchored into the ground. The manufacturer recommends that if you expect strong winds or severe weather that you remove the top as weather related damage is not covered under warranty. The legs are in two pieces and would have to be assembled when assembling the canopy. I had no trouble putting the canopy up until I got to the cover. Next time I'll forego the instructions and put the cover on before I put all of the legs in place so I can walk around it and properly position it. Stayed up in a pretty good windstorm but I also used ratchet tie-downs on either end to secure it to my dock. After 2 weeks we haven't had a single issue. Easy to set up and huge and looks awesome! I received mine as a Christmas gift three years ago. I expected it to last until the following summer. It's lasted three years so far. Soon I will order a replacement canopy, but the frame is like new. you guys rock. I received my canopy when you said I would, it went up easy and was the toast of the wedding. thanks for helping to make a very memorable occasion. 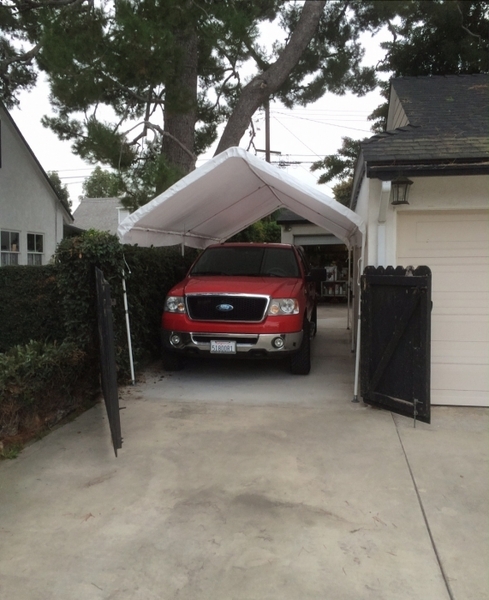 For the money we found the canopy to be of good quality materials and workmanship. Its a fine product can you get some one to put it together for me? ProsIts just what I wanted to cover my picnic table & fire place in my back yard. ConsPutting it together, I have a back problem & Knees to it would be nice if you could get somebody to put it together for me,I,am a Senior & 83 yrs. old & have a problem some times doing things! I added cement blocks and brackets to hold it down and it's been standing for few weeks in spite of the wind. I'm very satisfied with it. ProsIt's cheap and provides the cover I was looking for. Easy to put up. I secured it to my deck with eyelets and ratchet straps. It has helped to keep my deck 10 degrees cooler. Love it! I love the canopy. I put it in my backyard and I don't have to worry about rainy days anymore. It is easy to assemble and sturdy enough to keep it up all summer. Love it, love it!